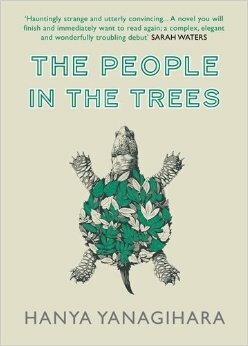 The People in the Trees is written in the form of the fictional memoirs of Dr. Norton Perina, a once renowned scientist who won the Nobel for seemingly uncovering the secret of eternal life, but who has now fallen into disrepute. Perina has been convicted for sexual abuse; in the introduction, written in the voice of Perina’s friend and defender Dr. Ronald Kubodera, we’re told he’s writing his memoirs in prison. The narrative then goes back to young Norton’s life, particularly focusing on his expedition to the remote Micronesian island of Ivu’ivu, the discovery that followed, and its far-reaching consequences for the islanders. As I’m sure you can imagine, this is a horrifying novel in many ways, but also one that’s very satisfying to dig into. I really enjoyed discussing it with Aarti, particularly its use of unreliable narrators and portrayal of colonialism. Do join us at Booklust for more — many thanks to Aarti for reading The People in the Trees with me, and also to Jenny for recommending it to us!